It takes a special group of artists to collaborate for musical performance on multiple turntables. 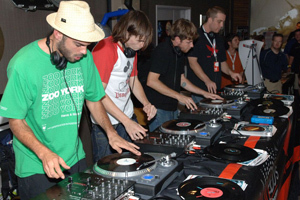 Birdy Nam Nam are a DJ crew from France whose members are Crazy-B, DJ Pone, DJ Need, and Little Mike. Birdy Nam Nam have won several DMC World Team Championships throughout their career. Birdy Nam Nam uses the TTXUSB turntable in their performances and it's one of the reasons they win championships. In addition, Birdy Nam Nam worked in collaboration with Numark on the creation of the PRO-SMX mixer. Birdy Nam Nam's goal is to use the turntable player as an actual musical instrument. Their self-titled debut album was released in 2006 on Uncivilized World Records, and in March of that year, they performed at the internationally-renowned music conference SXSW. The group's name is taken from a line in the 1968 Peter Sellers film The Party, directed by Blake Edwards. They gain their music from friends, owned albums, and press beats and patterns into vinyl to assemble their music live. In 2010, Birdy Nam Nam received the award for best electronic or dance music recording of the year for "Manual For A Successful Rioting " during the 25th Victoires de la Musique yearly French music awards ceremony at the Zenith concert hall in Paris. "The TTXUSB turntables are really at the core of our performances."